jobs in District Courts and District Legal Services Authority of Rajasthan State. There are total 2046 vacancies available in Rajasthan High Court recruitment for District Court and District Legal Services Authority. 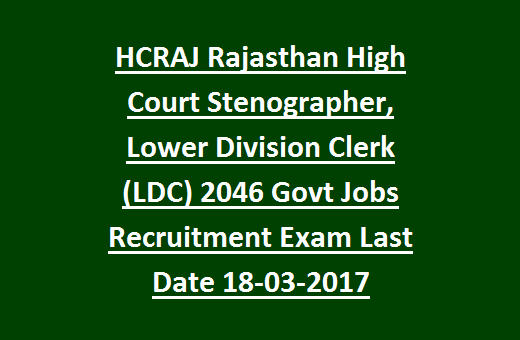 Out 2046 posts, 1733 Lower Divisional Clerk and 313 posts of Stenographer (English/Hindi) and Stenographer Grade II posts available in Rajasthan High Court Recruitment. Selection for this HCRAJ Stenographer recruitment will be held through Written Examination (Only for LDC), English Shorthand Test, Hindi Shorthand test, Computer Test (Speed Test, Efficiency Test) and Interview. Eligible candidates can submit their application form online from 22-02-2017 to 18-03-2017. For offline application last date is 21-03-2017. 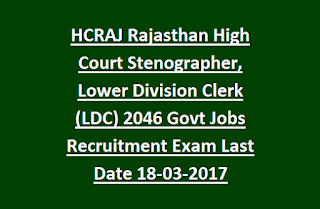 See the below given details for how apply online or offline, available vacancies, Selection Process, Exam pattern and syllabus (LDC) for High Court of Rajasthan state Stenographer, Stenographer Grade II and Lower Division Clerk Jobs recruitment 2017. Post Name and vacancy details are given below. For Lower Division Clerk posts candidate must have qualified Senior Secondary Examination/12th/Intermediate from a recognized board or university. For Stenographer Posts Candidate must have passed Senior Secondary Examination/Intermediate/12th from a recognized board. Senior Secondary School Examination with Computer is one of the optional subject or it equivalent. Candidate must have attain 18 years and should not crossed 35 years. Age relaxations are applicable for SC/ST/BC candidates and women candidates for 5 years. Selection for LDC Jobs of HCRAJ will held in 2 different stages. Written Exam will be conducted for 200 marks. Download Exam Pattern and Syllabus for LDC Jobs. For General and OBC candidates exam fee is Rs.100/- and for SC/ST/Widow/Women/PWD candidates exam fee is Rs.25/-. Candidates can apply through online or offline. For applying online candidate must have submit the application form online through official website of Rajasthan High Court @www.hcraj.nic.in. Last date for submission of application form for Stenographer and LDC jobs is 18-03-2017. For Offline application submission candidate can download the application form from HCRAJ website and then send the application form along with all supporting documents to "The Registrar Exams, Rajasthan High Court, Jodhpur". Last date to reach the offline application form is 21-03-2017.